test - Friday (Bowl game losses leave sour taste) edition: Wha' Happened? 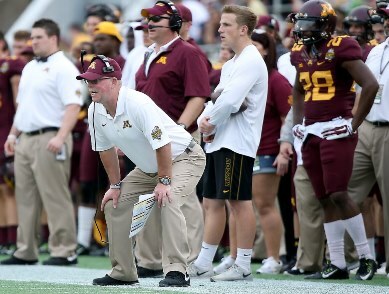 Jerry Kill and his staff are building the Gophers football program the right way. While we might get a little tired of hearing "brick by brick" as often as it gets repeated, it is the way to go when trying to turn around any program, let alone one that has had a half-century of mostly struggle. Low and slow is the way to cook this thing; those who have attempted to bring it to a quick boil (see: Tim Brewster) have come away burned. This program has undoubtedly progressed in each of Kill's four regular seasons: 3-9 his first year, 6-6 his second, 8-4 his third and again 8-4 this season, but with an extra Big Ten victory and a real chance at a conference title. All indications are that next year's team could keep moving along that arc, as the Gophers' athletes and depth continue to improve. All of that said, this is the third consecutive season that momentum has stalled during a bowl game — and this year's loss to Missouri was probably the most painful of the three bowl losses under Kill. While the foe was formidable, the magnitude of the game was raised and there was a sense watching Thursday that Minnesota's chief opponent was not from the SEC but rather from the Big Ten. The Gophers, in large part, beat the Gophers. The game again leaves a lingering sour taste going into the offseason. It's not enough to offset the good work of Kill and his staff, though some of the in-game decisions Thursday reinforced the opinion that the group is superior at program-building but retreats back to the pack on game days. It's not quite Glen Mason all over again, with epic blown leads, though there still isn't anything Kill has done that Mason didn't do except for reach a caliber of bowl one tier higher (and Mason did, let's not forget, win three consecutive bowl games from 2002-04). Still, while bowl games are largely window dressing for a season, they are the last on-field impression you leave for many months. Unless you want to count a moral "victory" 34-31 loss to Texas Tech a couple years back (which we don't), the Gophers haven't added any bricks during bowl seasons under Kill.